Lawrence H. Summers is the Charles W. Eliot University Professor at Harvard. The Harvard Kennedy School maintains an abiding commitment to advancing the public interest by training skilled, enlightened leaders and solving public problems through world-class scholarship and active engagement with practitioners and decision makers. The school offers the depth, reflection, insight and excellence of ideas and teaching that can shape future leaders, affect public policies, and make an impact on people and their daily lives. Lawrence H. Summers is the Weil Director at the Mossavar-Rahmani Center for Business & Government. Now more than ever, government policy and private sector activity are at critical points both domestically and abroad. The shock of the financial crisis, the shifts in the distribution of global economic power, and the changes being brought about by information technology combine to make this an unusually important moment to reexamine traditional assumptions about economic policy and the relationship between the public and private sectors. The Mossavar-Rahmani Center for Business & Government (M-RCBG) is uniquely positioned to play a critical role in this process as an incubator of ideas informing policy-based solutions and as a focal point of engagement for faculty and students, many of whom will play important roles in addressing the problems which confront us today. 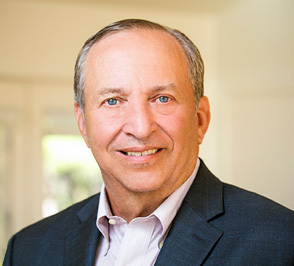 Lawrence H. Summers is a member of the advisory council as well as an author for the Hamilton Project. The Hamilton Project offers a strategic vision and produces innovative policy proposals on how to create a growing economy that benefits more Americans. The Project’s strategy reflects a judgment that long-term prosperity is best achieved by fostering economic growth and broad participation in that growth, by enhancing individual economic security, and by embracing a role for effective government in making needed public investments. Lawrence H. Summers sits on the board of directors at The Peterson Institute for International Economics. The Institute is a private, nonprofit institution for rigorous, intellectually open, and honest study and discussion of international economic policy. Its purpose is to identify and analyze important issues to making globalization beneficial and sustainable for the people of the United States and the world and then to develop and communicate practical new approaches for dealing with them. The Institute is completely nonpartisan.